It will be the longest “blood Moon” eclipse of the 21st century (see news-how-to-see-longest-blood-moon-eclipse-mars-space or eclipse lunar 2018-july-27 ). At its very centre, we can see a small, six-armed, “windmill” shape in miniature, which is turning rapidly clockwise (as shown in a lower-left part of the slide above). Finally at the ends of three other “blades” of that large “turning windmill”, we can see three small circles of crop which have been laid down carefully in a zigzag (or in-and-out) pattern, just like was done near Rollright Stones in August of 2017. Each of these small circles contains 12 zigzag motifs. One of these three images is shown in a lower-right part of the slide above. Such a small circle with 12 zig-zag motifs may perhaps represent 12 lunar months of 354 days, as the approximate interval of time between yearly “eclipse seasons”. Then on the opposite side of this “turning windmill”, we can see a “F-shaped” symbol which is the usual signature of an E.T. crop artist called “Quetzalcoatl”. It was drawn also within a recent crop picture near Sutton Hall in Essex on June 30, 2018. A smiling face to you all! 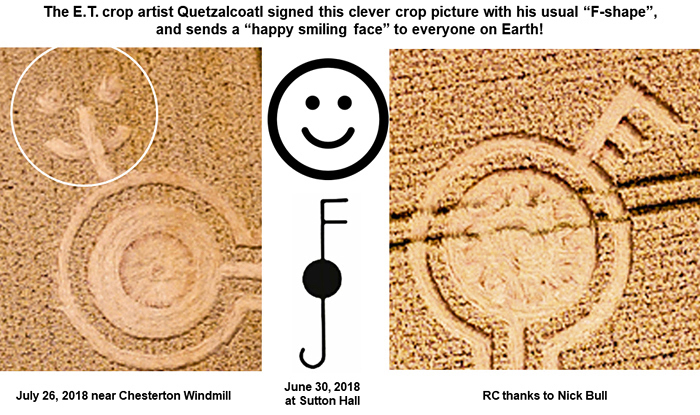 We would like to extend a “smiling face” to you also, Quetzal, as well as to all of your colleagues or fellow crop artists, who may be headed for Earth now. Some of us here on Earth are very grateful for all of the beautiful field art which you and your friends have provided for the past 29 years. Finally we would like to send a “smiling face” and good wishes to Roeland Beljon and his friends or colleagues, who will meet at Coronation Hall in Alton Barnes on August 1, 2018 for an annual “Night of Crop Circling” (see night of crop circling 2018 ). What a wonderful 2018 season it has been so far, with many more beautiful and clever field images still to come. What a wonderful “blood Moon” lunar eclipse we saw last night, with red planet Mars not far away in the night sky! Could the “turning windmill” crop picture which appeared next to Chesterton Windmill be some kind of “clock”? Will Quetzalcoatl return to Earth after three more “total lunar eclipses”, or after three more “11 month” eclipse years? When we study the new crop picture at Chesterton Windmill in close detail, we come up with several important but unanswered questions. First, why did some E.T. 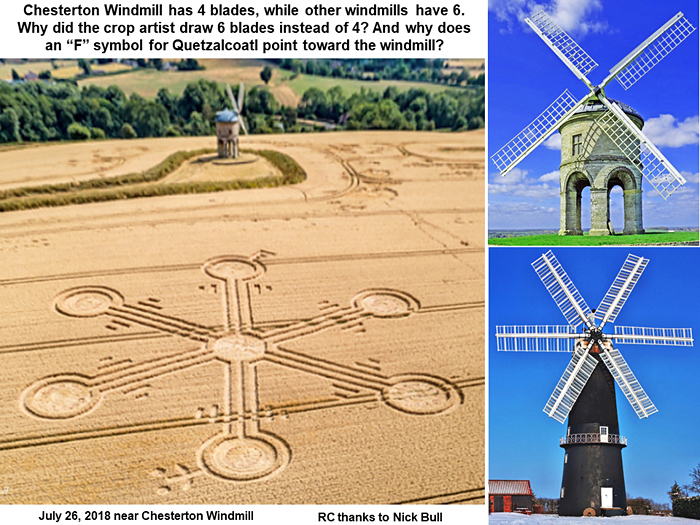 artist draw in crops the beautiful image of a “turning windmill” with 6 blades, since anyone can see that the real windmill at Chesterton (toward which the crop picture points) has only 4 blades? Secondly, why did the crop artist add a small “F-shaped” symbol, which usually stands for “Quetzalcoatl”, on one of those six “blades” which lies closest to the real windmill? Between that bird’s “eye” and the real windmill, a new crop picture was drawn as shown in the slide above, outlined in red. What about the two unanswered questions mentioned earlier? We can provide reasonable answers now. 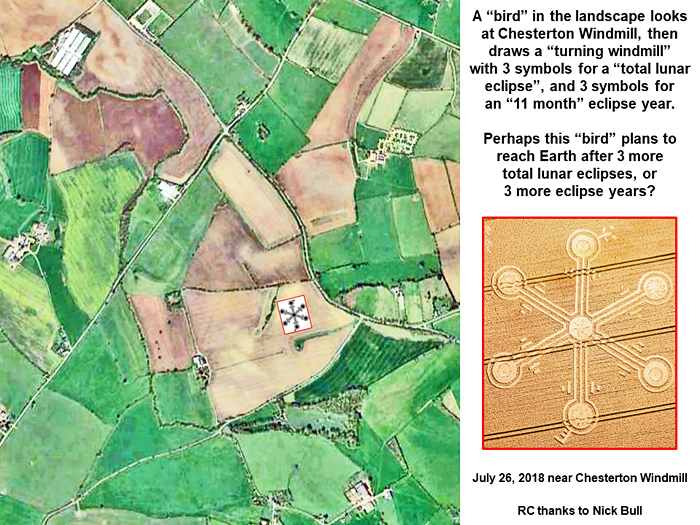 First, the crop artist Quetzalcoatl often portrays himself humorously as a “bird”, whether in flattened crops (for example an “eagle” drawn at Uffcott Down in 2015), or by using schematic images in the landscape nearby. So a small “F-shaped” signature for this crop picture makes perfect sense, if a “bird” whose real name is “Quetzalcoatl” was the unseen crop artist. Next, why did he draw six “blades” rather than four? Those six “blades” show two different kinds of detailed images near their ends. 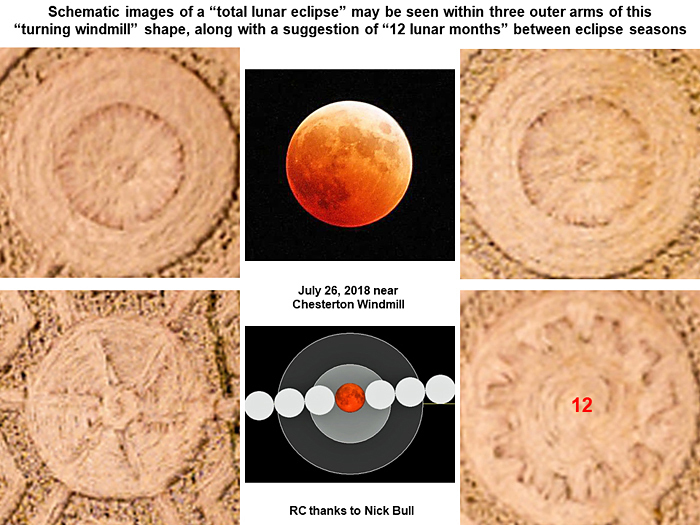 On three of the six blades, we can see the small, round image of a “total lunar eclipse”. 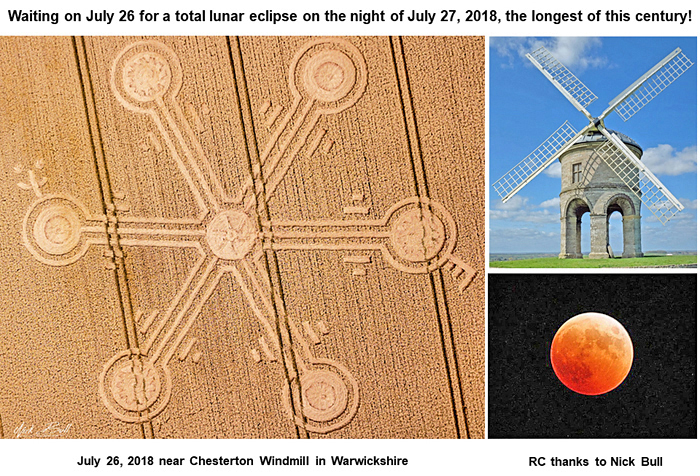 On the other three of those six blades, we can see a circular pattern of in-and-out laid crop, which might represent approximately “11 months” of 30 or 31 days from any “eclipse year” of 347 days. The next three “total lunar eclipses” will take place on July 27, 2018, then January 21, 2019, then May 26, 2021. So there will be three “eclipse years” of 11 months each, from July 27, 2018 until the third total-lunar-eclipse takes place on May 26, 2021 (a difference in time of 34 months). Both kinds of small, patterned crop-circle image therefore seem to be telling us the same thing. 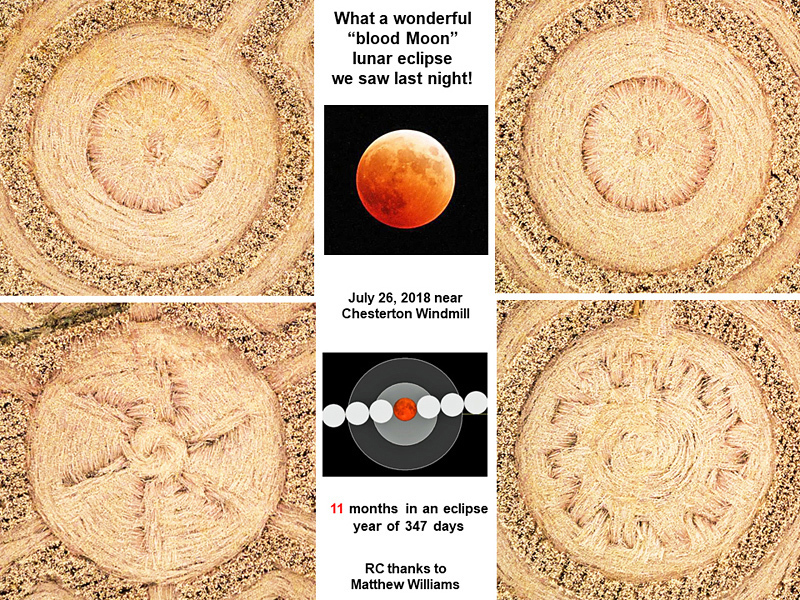 In summary, this crop picture tells us in two different ways about a time period of “3 eclipse years”, or approximately 34 months, following a total lunar eclipse on July 27, 2018. Will Quetzalcoatl return to Earth sometime in the next decade, maybe even as early as 2021? Perhaps that E.T. “bird” called “Quetzalcoatl” plans to return to Earth sometime around May or June of 2021, which would be approximately three eclipse years or three total-lunar-eclipses from now? Many crop pictures from the past have used concurrent astronomical events, such as an “opposition of Mars” (described near Gander Down or Ovington Down in 1995), or a “conjunction of Venus with our Sun” (described near Kings Somborne or Knoll Down in 2011), to make similar suggestions about open contact between humans on Earth, and friendly extra-terrestrials in the near-future. My long-term study of such crop pictures seems to suggest some date for that historic event in the next decade of the 2020’s. The spring or summer of 2021, as noted here, would be among the earliest possible dates to be suggested so far.